The previous post described our visit to the Eastern rock-climbing Mecca known as Seneca Rocks. Our tour guide, Richard from Pittsburgh, told us a tale too long for the previous post. 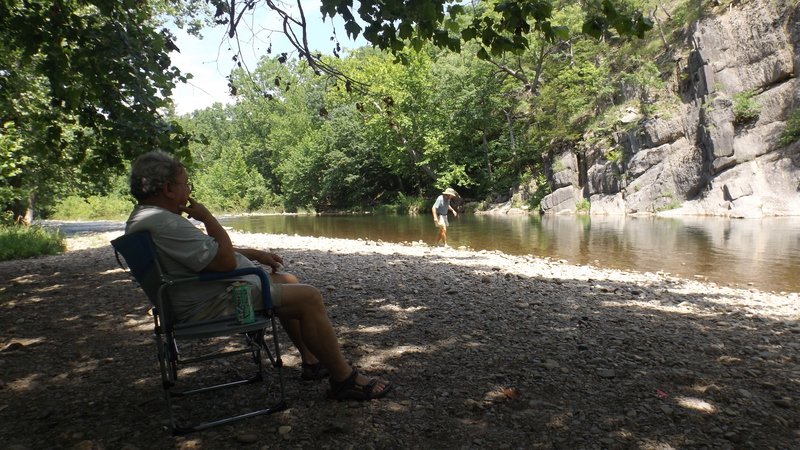 His story – and this one – entwines Seneca Rocks, religious sects, and human frailty. 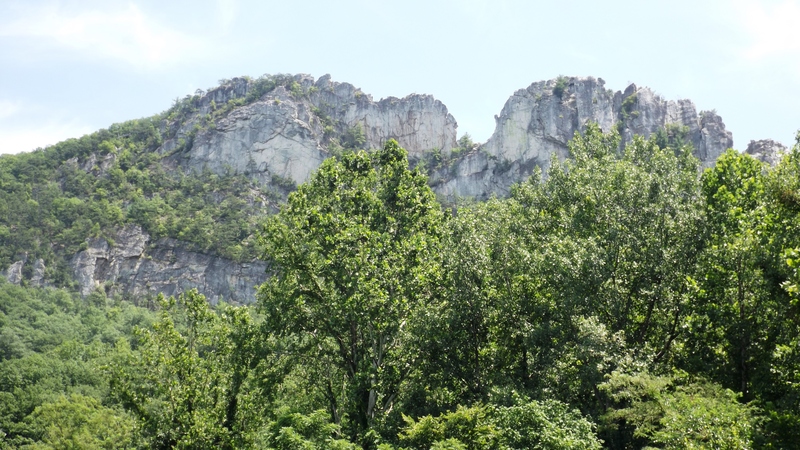 The park rangers assigned to Seneca Rocks are too few to handle a serious injury rescue. They rely on the townsfolk, many of whom grew up scaling those cliffs. Most of the townsmen are Mennonites, or Anabaptists, an early branch off from Catholicism. They believe that effective baptism must be voluntary on the part of the recipient, and since newborns lack free will, true acceptance of the faith can only happen many years later. They broke off from The Church within a decade or two of Martin Luther, maybe before, perhaps after. On those dates The Chronicles are vague. Modern Mennonites are serious as cancer about sin, the Bible, and the role of God in everyday life. The Amish eventually split off from the Mennonites to form an even sterner religion. Um-hmmh. According to Richard, early one summer evening a fellow climbing alone broke his leg on a highly technical (a serious mistake can be fatal) descent. Word went out and the climbing community marshaled their resources. Nearly a hundred sturdy fellows with ropes, rock anchors, carabiners, and years of experience on the Rock appeared in less than an hour. 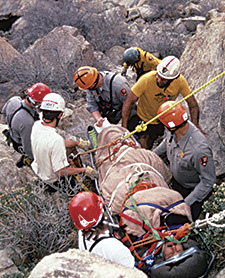 They formed a human ant line at solid footholds along the way to the injured climber. Their plan was to pass up a stretcher, strap the broken man to it, and pass him down from one secure station to another. This they had done a few times before. In Richard’s version the pastor’s response was much shorter: He thundered just one enraged monosyllabic verb preceding ‘him’. I never lie to you my readers. I cannot believe a man of the cloth would use, let alone shout such an oath. At least not in the presence of so many of his flock. The rescuers went home. The climber spent a sleepless night on the Rock and found his exit point at first light, then slunk back into camp before noon. He quit rock-climbing and took up sky-diving. Jumping out of planes just seemed more forgiving. Are you sure this is a myth? It would torque my shorts big=time to go to this degree of trouble for a bozo who didn’t plan his climb or care anything about others. That’s what I’d have said. My reference to it as a myth is not that it isn’t a total truth. I thought the emoticons would convey the tongue-in-cheek aspect. Agreed. He got what he deserved. The climber should have told the truth from the start, not caused all of those people to come to his aid, and so on. I need to find a class on emoticons. It seems I also need a course.